Oil is one of the most hotly debated topics in the energy debate, with 'peak oil' lying at the heart of the argument. Who are the world's biggest producers? In 2006, the U.S. Energy Information Administration figures for production reveal that Saudi Arabia is the world's biggest oil producer, with 10.6 million barrels being filled every day, Russia produces 9.6 million and the U.S. 8.3 million. According to an OECD International Transport Forum discussion paper published in 2007 there are around 47,000 oil fields in the world. But only a fraction of these -- around 500 - are considered 'giant' -- harboring upwards of 500 million barrels. In January 2008, oil prices reached the not so magic $100 figure. Five months on and a barrel of light sweet crude oil is pushing towards $130. Some, like Goldman Sachs and the Organization of the Petroleum Exporting Countries (OPEC) think oil might soon cost upwards of $200 a barrel. Good for the oil companies who are posting record profits -- watch John Hofmeister, president of Shell Oil Company, the U.S. division of Royal Dutch Shell defend rising profits -- but bad for industry and consumers. In recent years though, the exponential growth of the economies in China and India has meant the story is one of demand. Couple this with a rise in car ownership -- 500 million in 1990 to around 750 million in 2008. If predictions are correct then expect that figure to almost double by 2030. If you throw in planes and trains to go with all the automobiles along with shipping and it's not difficult to understand why oil demand is rising so much. According to the International Energy Agency's 2007 Key World Energy Statistics report, just over 60 percent of all the oil produced in 2005 found its way into a petrol tank of one description or another. Principal Voices: A necessary evil? Booming economies like China's also need oil to make their goods. Not just to power the production lines, but to make a range of products we all consume every day. All this demand has put a strain on oil refineries whose costs and workload have risen in recent years. New environmental regulations requiring 'cleaner' grades of petrol have added to their burden. The recent strike by workers at the Grangemouth refinery in Scotland threatened to pile further misery on British motorists and highlighted the economic and political sensitivity that oil demand is creating. In recent weeks, a veritable slick of accusations have been laid at the door of financial speculators. Sen. Barack Obama, OPEC, Saudi Arabia's King Abdullah and German leaders are just some of the high profile figures pointing the finger at speculators. But energy analyst Daniel Yergin isn't so sure. In June 2008, he told the U.S. Congress' Joint Economic Committee: "There is a tendency to seek a single explanation. History, however, demonstrates that changes of this scale and significance result not from a single cause, but rather from a confluence of factors." Aren't there problems with supply as well? Yes. Tension over supplies has never really gone away either, especially in the Middle East where decades of disagreements and conflict have continued to feed uncertainty into global stock markets. Terrorist activities and the consequent disruption to oil supplies in other parts of the world -- notably in Nigeria -- still provoke a collective fit of the jitters amongst economists. All of the world's resources are finite so we will run out at some point. The big debate at the moment is about when oil production will peak -- i.e. when half of oil stocks have been used and production begins to slow. Texan born geophysicist Dr M. King Hubbert first came up with the peak oil theory -- known as 'Hubbert's peak' -- in the 1950s, arguing that U.S. oil production would peak in the early 1970s. He was right. And since 1981, the world has been using more oil than it has been finding. OPEC states that there were oil reserves of 1.1 trillion barrels in 2006, of which they control over three quarters. They predict that current stocks will last 81 years if consumption remained at 2006 levels -- 76 million barrels per day (mb/d). "We have a decline in production at today's oil fields of roughly 4 percent a year. At current production levels [82mb/d] that means we are going to lose 30 million barrels a day over the next ten years," Aleklett told CNN. He highlights the current situation in China. The Chinese economy is growing at around 10 percent each year and oil production in the country at full capacity. This means that China will have to import much more oil than the current figure of 3.5 mb/d. "This will push the demand for oil to a completely different scale," Aleklett said. He believes that the worst-case scenario for peak oil is a plateau from 2007 -- 2012 before oil production starts to decline. The best case will be that production will go up to 93 mb/d. But he thinks that this would require the 10 giant oil fields in Iraq to go into production now. But surely we'll keep on finding oil to replace depleted stocks? Well, Brazil and Mexico have found big oil fields in recent years and oil companies are investing heavily in Canadian oil sands in Alberta where it's thought to be plentiful. But like the tar sands of the Orinoco Belt in Venezuela this oil is difficult and expensive to extract, as well as being environmentally controversial. Professor Aleklett remains pessimistic about increased rates of discovery in the coming years. "If you look at the discovery trends over the past 40 years, we will find 150 billion barrels in the next 30 years. 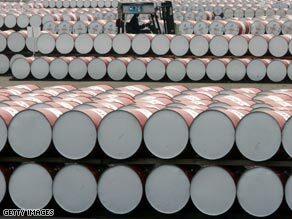 If you are consuming 30 billion barrels every year means that that stock will last five years," he said.